The deal you worked out with Universal was that you shared in the profits of that film, is that correct? No, no, that was to come later. I was paid amply but I didn’t get a gross piece until two or three pictures after that. Not that there was. There were no profits in that picture. You were involved in the beginning, being consulted on casting choices, were you not? Well that’s normal, you know. The lead players usually have some input if not an absolute power of approval. That’s not uncommon. I also suggested… not Janet Leigh, they’d already signed her and that was a good choice, I was content with that, but Dennis Weaver. I’d suggest Dennis Weaver because I knew him and knew his work and I suggested, that was after we’d started shooting, and I suggested him to Orson and he hired him. Another significant piece of casting for that film. Oh yes, he was wonderful in it. Both you and Welles came from very strong theater backgrounds, isn‘t that right? And there was a two week rehearsal period before they started shooting Touch of Evil? No, Orson rehearsed one scene. You remember the scene in the apartment before they find the dynamite? That was quite a long scene, it was thirteen pages, and Orson took the principals. If you remember the scene there were policemen and guys bringing in donuts and stuff like that, there were a lot of bit players and he didn’t bother to call them in, but he rehearsed the principals. In other words the young actor who played the Mexican boy who later turns out to be the murderer, and Joe Calleia and me and Orson. But we rehearsed the day before shooting started and then it was a very complicated shot because he was clearly, it became evident when he was setting it up on the set, that he was going to do a sot of the whole scene, all thirteen pages, in one setup. And he had to have pieces of the set moved aside and so on, very difficult. And on the first day of shooting which was the next day, a Monday, we all of course showed and it’s an iron custom in movie studios that when you’re starting a picture one of the second assistant directors calls the production department the first time you turn over on a given shot – when you say “turn over” you mean the camera is turning over – and then when they print the first take. And we hadn’t even started shooting until after lunch and there were emissaries standing in dark corners acting nervous. They didn’t dare say anything, but you could see they were very upset. And we didn’t start actually shooting until about 3:00 in the afternoon and each time you had to reset all the machinery and so on, it was quite complex. And Orson did, oh I suppose it was eight or nine takes and finally about 5:30 he said “Okay, print the last take. That is a wrap on this scene, we are three days ahead of schedule.” And of course it was something he just did to give them confidence that he was not going to be a difficult director to work with and the studio thought “Boy, he’s gonna do this in almost every scene.” Of course he never did it again, but it was an example of his resourcefulness when he wanted to. He did have a reputation for being profligate, which as you say was unfounded. Yes, that’s not fair. I know directors who’ve spent more money on one day’s shooting than Orson did on the whole picture. But he was somewhat unpredictable and I think so many things for Orson that I think he sometimes deliberately painted himself into a corner so he could jump free and show off. But he was a wonderful director to work for. Actors loved him, so did crews. A strange and unhappy thing, he could just charm the birds out of the bloody trees and as I said actors and crewmen just thought he was great, but he almost deliberately seemed to go to lengths to ignore or even insult studio executives. Now that’s a very bad idea because those are the guys with the money and if they don’t give you the money you don’t get anymore sets of electric trains to play with. And I’ve no idea why he did this. Maybe he just instinctively resented authority. See, the crew people and the actors presented no threat to his authority as director but the studio heads did. That’s just conjecture but I’ve no other explanation for the fact that he was as difficult, deliberately difficult with studio heads as he was. Did he originally plan to shoot in Venice? I talked to Janet Leigh a couple of weeks ago and she suggested that possibly going to Venice was a way of getting away from the studio and shoot basically outside of the studio environs. No, what it was, was Orson wanted to shoot in Mexico and the studio would have none of that, but he never thought, nor did the studio, of shooting all the picture on a soundstage. There’s too many good locations around. No, Janet’s mistaken about that. Venice was a very good place to shoot. It’s ideal: it’s got a canal, it’s got run down, seedy old buildings, the hotel we shot in was really a fleabag. But it suits the picture very well. It sets the picture beautifully. And it also has the oil wells, all those things. At what point in the scriptwriting process was the Venice found? I know he was rewriting the script practically up to the day shooting began. Well, he had rewritten the script by then. You can very easily have a complete script the way you want it without having finally chosen your locations. I was wondering how much, having found the locations and more importantly getting the actors on location, how much he would then use what he found around him to start tweaking things. Well, you do that normally. That’s not unique to Orson. Obviously you, no matter how carefully you’ve built a set or chosen a location, when you actually come to shooting the scenes, why you discover other possibilities within the bounds of where you’re shooting. For instance, in this hotel we were shooting late one night into the night and it was, oh I don’t know, 2:00 in the morning, and we still had a little bit of stuff to do and Orson and I were down in the basement, there was no men’s room in the lobby, and we went down in the basement and were peeing in a drain in the corner, and he said “You know this is a great area down here.” He says “We ought to use this. Wouldn’t this be great for the scene between you and Joe Calleia when he gives you my cane?” And I said “Yeah, that would be great, but I think the studio’s got it scheduled for Monday and they must have built a set on the lot.” He said, “Yeah, this is much better though. We’ll just get Joe down here.” I said “Orson, for God’s sakes, he going to be in bed. It’s 2:00 in the morning.” He said “No, it’ll be good because he’ll be all upset and stumbly when he gets down here.” And so he did and we shot the scene down there, but before I had said “But Orson, you’ve got three more shots to make right now as it is.” He says “I don’t need those shots. We can skip those shots. I can cut the scene together without those.” But it was a great place to shoot the scene and it helps the picture. So that’s an example of taking example of a location after you’ve chosen it. You mention that he had a great way of charming the actors. Yes, I’ve said that. I said he was marvelous with actors. When it came time to directing a scene, how did he actually…? Charming is the wrong word. He was a charming man in his dinner conversation or something, but I don’t he mean he went around kissing he actors or anything. But he was very good with actors. He was very good with crewmen too. When he was directing the picture he would have you do what he wanted you to do, as would any director. 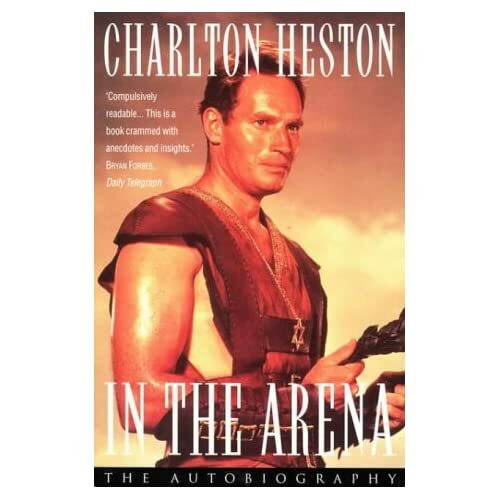 You also wrote, in “In The Arena: An Autobiography,” that he had a way of making every scene seem like it was the most important scene in the picture. Well he could do that, yeah, and often would. A scene that seems like a trivial scene, a short one shot scene, he could give you some ideas as to why it was a very important scene and that’s useful too. Yes, exactly, because the director has the final control and now, when I’m mostly working with directors younger than I and greener in reputation, I say “You know I have strong opinions and if I disagree with you on a shot I’ll tell you so, but if you can’t persuade me, why just tell me to do it because you’re the director, and I will.” I’ve never had any trouble with that, that always works. So did you find that you were able to bring a lot of your own creative contributions to Touch of Evil? Well, you know, an actor brings his creative contributions in his performance. He better bring something, that’s what they want him for. (laughs) I’m currently working on my 73rd picture so this horse knows the road, but I’ve never really had a quarrel with a director ever in 73 films. It’s counterproductive. I’m afraid I’ve got to wrap it up now. Is that suited for you? There was one more question if you have time. You and Orson appear to have hit it off so well on Touch of Evil that you wanted to do some other productions with him after that. None of those projects ever came to fruition. Was there anything that you had particularly hoped to do together that didn‘t happen? Well, he was talking about doing Don Quixote and when I was up working for [William] Wyler in The Big Country, that’s when he walked off the picture. Not permanently, but of course it turned out to be permanent because you can’t do that. He had done his first cut so he went to Mexico to see if he could raise money for Don Quixote, which he couldn’t do. But then when he came back the studio was just furious, and they were right to do so. You can’t do that. It was a huge mistake on his part.